The recent murder of Anna Politkovskaya is grim evidence of the danger faced by journalists passionately committed to writing the truth about wars and politics. A longtime critic of the Russian government, particularly with regard to its policies in Chechnya, Politkovskaya was a special correspondent for the liberal Moscow newspaper Novaya gazeta. Beginning in 1999, Politkovskaya authored numerous articles about the war in Chechnya, and she was the only journalist to have constant access to the region. 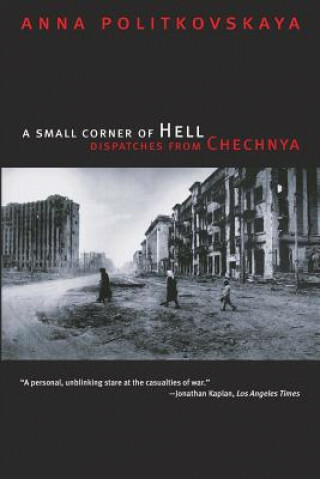 Politkovskaya's second book on the Chechen War, "A Small Corner of Hell", offers an insider's view of this ongoing conflict. In this book, Politkovskaya focuses her attention on those caught in the crossfire. She recounts the everyday horrors of living in the midst of war, examines how the Chechen war has damaged Russian society, and takes a hard look at the ways people on both sides profited from it. Now available in paperback, "A Small Corner of Hell" ensures that Politkovskaya's words will not be erased.